Landsat 8 Collection 1 Tier 1 DN values, representing scaled, calibrated at-sensor radiance. 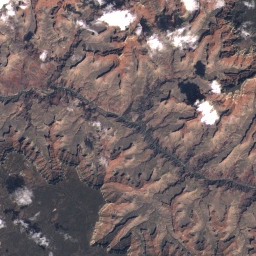 Landsat scenes with the highest available data quality are placed into Tier 1 and are considered suitable for time-series processing analysis. Tier 1 includes Level-1 Precision Terrain (L1TP) processed data that have well-characterized radiometry and are inter-calibrated across the different Landsat sensors. The georegistration of Tier 1 scenes will be consistent and within prescribed tolerances [<=12 m root mean square error (RMSE)]. All Tier 1 Landsat data can be considered consistent and inter-calibrated (regardless of sensor) across the full collection. See more information in the USGS docs. 0: Not Determined / Condition does not exist. The file name for the Bias Parameter File (BPF) used to generate the product, if applicable. This only applies to products that contain OLI bands. The file name for the Bias Parameter File (BPF) used to generate the product, if applicable. This only applies to products that contain TIRS bands. Percentage cloud cover, -1 = not calculated. Percentage cloud cover over land, -1 = not calculated. Datum used in image creation. Earth sun distance in astronomical units (AU). Elevation model source used for standard terrain corrected (L1T) products. Ellipsoid used in image creation. File date in milliseconds since epoch. Combined Root Mean Square Error (RMSE) of the geometric residuals (metres) in both across-track and along-track directions measured on the GCPs used in geometric precision correction. Not present in L1G products. RMSE of the X direction geometric residuals (in metres) measured on the GCPs used in geometric precision correction. Not present in L1G products. RMSE of the Y direction geometric residuals (in metres) measured on the GCPs used in geometric precision correction. Not present in L1G products. Grid cell size used in creating the image for the panchromatic band. Grid cell size used in creating the image for the reflective band. Grid cell size used in creating the image for the thermal band. The number of ground control points used. Not used in L1GT products. Values: 0 - 999 (0 is used for L1T products that have used Multi-scene refinement). The composite image quality for the OLI bands. Values: 9 = Best. 1 = Worst. 0 = Image quality not calculated. This parameter is only present if OLI bands are present in the product. The composite image quality for the TIRS bands. Values: 9 = Best. 1 = Worst. 0 = Image quality not calculated. This parameter is only present if OLI bands are present in the product. Calibration K1 constant for Band 10 radiance to temperature conversion. Calibration K1 constant for Band 11 radiance to temperature conversion. Calibration K2 constant for Band 10 radiance to temperature conversion. Calibration K2 constant for Band 11 radiance to temperature conversion. The naming convention of each Landsat Collection 1 Level-1 image based on acquisition parameters and processing paramaters. The Pre-Collection naming convention of each image is based on acquisition parameters. This was the naming convention used prior to Collection 1. Projection used to represent the 3-dimensional surface of the earth for the Level-1 product. Nadir or Off-Nadir condition of the scene. Number of product lines for the panchromatic band. Number of product samples for the panchromatic bands. Name and version of the processing software used to generate the L1 product. Additive rescaling factor used to convert calibrated DN to radiance for Band 1. Additive rescaling factor used to convert calibrated DN to radiance for Band 10. Additive rescaling factor used to convert calibrated DN to radiance for Band 11. Additive rescaling factor used to convert calibrated DN to radiance for Band 2. Additive rescaling factor used to convert calibrated DN to radiance for Band 3. Additive rescaling factor used to convert calibrated DN to radiance for Band 4. Additive rescaling factor used to convert calibrated DN to radiance for Band 5. Additive rescaling factor used to convert calibrated DN to radiance for Band 6. Additive rescaling factor used to convert calibrated DN to radiance for Band 7. Additive rescaling factor used to convert calibrated DN to radiance for Band 8. Additive rescaling factor used to convert calibrated DN to radiance for Band 9. Multiplicative rescaling factor used to convert calibrated Band 1 DN to radiance. Multiplicative rescaling factor used to convert calibrated Band 10 DN to radiance. Multiplicative rescaling factor used to convert calibrated Band 11 DN to radiance. Multiplicative rescaling factor used to convert calibrated Band 2 DN to radiance. Multiplicative rescaling factor used to convert calibrated Band 3 DN to radiance. Multiplicative rescaling factor used to convert calibrated Band 4 DN to radiance. Multiplicative rescaling factor used to convert calibrated Band 5 DN to radiance. Multiplicative rescaling factor used to convert calibrated Band 6 DN to radiance. Multiplicative rescaling factor used to convert calibrated Band 7 DN to radiance. Multiplicative rescaling factor used to convert calibrated Band 8 DN to radiance. Multiplicative rescaling factor used to convert calibrated Band 9 DN to radiance. Additive rescaling factor used to convert calibrated Band 1 DN to reflectance. Additive rescaling factor used to convert calibrated Band 2 DN to reflectance. Additive rescaling factor used to convert calibrated Band 3 DN to reflectance. Additive rescaling factor used to convert calibrated Band 4 DN to reflectance. Additive rescaling factor used to convert calibrated Band 5 DN to reflectance. Multiplicative factor used to convert calibrated Band 7 DN to reflectance. Multiplicative factor used to convert calibrated Band 8 DN to reflectance. Minimum achievable spectral reflectance value for Band 8. Multiplicative factor used to convert calibrated Band 1 DN to reflectance. Multiplicative factor used to convert calibrated Band 2 DN to reflectance. Multiplicative factor used to convert calibrated Band 3 DN to reflectance. Multiplicative factor used to convert calibrated Band 4 DN to reflectance. Multiplicative factor used to convert calibrated Band 5 DN to reflectance. Multiplicative factor used to convert calibrated Band 6 DN to reflectance. Multiplicative factor used to convert calibrated Band 9 DN to reflectance. Number of product lines for the reflective bands. Number of product samples for the reflective bands. Resampling option used in creating the image. The file name for the Response Linearization Lookup Table (RLUT) used to generate the product, if applicable. The amount of spacecraft roll angle at the scene center. Sensor used to capture data. Ground Station/Organisation that received the data. Sun azimuth angle in degrees for the image center location at the image centre acquisition time. Sun elevation angle in degrees for the image center location at the image centre acquisition time. Nearest WRS-2 path to the line-of-sight scene center of the image. Nearest WRS-2 row to the line-of-sight scene center of the image. Rows 880-889 and 990-999 are reserved for the polar regions where it is undefined in the WRS-2. Number of product lines for the thermal band. Number of product samples for the thermal band. TIRS stray light correction source. UTM zone number used in product map projection. The WRS orbital path number (001 - 251). Landsat satellite WRS row (001-248).